Unbeknownst to most harried commuters, Ada County Highway District (ACHD) is reducing pollution of the Boise River as part of many road improvement projects. ACHD is leading the valley in investment in roadway Green Stormwater Infrastructure (GSI), and new projects on State St. and Franklin Road demonstrate two different techniques. While ACHD has not permitted new discharges of stormwater to the Boise River for decades, stormwater from hundreds of miles of older roads travels through pipes to the Boise River carrying sediment, bacteria, nutrients, oil, grease, and heavy metals. Gross! 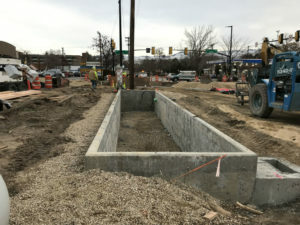 The Blooming of 15th and State St.
Bioretention planters were placed along the northwest, southeast, and southwest areas of the intersection of 15th and State St. in downtown Boise. The planters will be backfilled with bioretention soil media (BSM), a nutrient-rich, permeable, engineered soil matrix comprised of sand, aged compost, and trace silt. Plants selected for their ability to flourish in this unusual environment, including Joe Pye weed, Purple Maiden Grass, Culver’s root, ‘Black Adder’ Anise Hyssop, and Orange Coneflower, will be planted. In a large storm event, approximately 6,100 gallons of stormwater will enter the planters instead of discharging to the Boise River untreated. Additionally, the planters will beautify the intersection and offer habitat for invertebrates including important pollinators like native bees and butterflies. Bioretention planters can also be found on Royal Blvd. Bioretention Swales Spruce Up Franklin Rd. A different technique well suited for long stretches of rural roads is now in place on approximately .75 mile of Franklin Road between Black Cat Rd. and Ten Mile Rd. Bioretention swales were installed along both sides of Franklin Road and all four legs of the Franklin/Black Cat intersection. The bioretention swales are filled with BSM and were seeded in December 2017 with a native seed mix that includes drought tolerant grasses and wildflowers including western yarrow, California poppy, Blanketflower, Lewis flax, Scarlet globemallow, Sideoats grama, Thickspike wheatgrass, Idaho fescue, Sheep fescue, and Sandberg bluegrass. Bioretention swale on the north side of Franklin Rd. under construction. The swales are sized to retain approximately 253,437 gallons of runoff in a large storm event. Prior to installation of the swales, no stormwater system was in place along these sections of Franklin Rd. and Black Cat Rd., and runoff flowed overland into Purdam Gulch Drain or Kennedy Lateral then to Tenmile Creek and on to the Boise River. Like the planters on State St., the Franklin Rd. project swales will help to retain and remove pollutants from runoff before it enters our surface water. ACHD is an independent government entity that controls 2,100 miles of roads in Ada County. ACHD Commissioners are elected by region . For the past few months, Sage International School senior, Zoe Daly has been working on a project using Yellow Warbler data from the Intermountain Bird Observatory’s Boise River Research Station. In the Fall of 2017 IBO ran nets daily during fall migration for the first time ever! This gave us an excellent, fine-scale picture of migration at the river station. We were also able to complete a full MAPS breeding season banding protocol this summer, sampling songbirds at the site once every 10 days. Simultaneously, we collected the same data at our long-standing Lucky Peak station. This gave us the ability to compare between our Boise River and Lucky Peak stations like never before. When we first started banding at the Boise River site, we knew that it was special for Yellow Warblers (we once caught more than 200 of them in a single day!) but we had never looked at the hard data or quantified exactly what was going on. So, when Zoe came along and told us she loved looking at data and graphs, we knew exactly what she should do. Zoe took our banding data from Lucky Peak and the Boise River and compared Yellow Warblers at both sites. In particular, she looked at the fat levels of Yellow Warblers. She found that Yellow Warblers were significantly fatter at our Boise River Station than at Lucky Peak. This means that the habitat at the Boise River provides food that Yellow Warblers need during migration and stopover. They are able to spend time at the site, eat, and “fuel up” with fat for the next leg of their migration journey. Zoe also found that Yellow Warblers at Lucky Peak tend to leave the area soon after their young fledge…they don’t stay at the site during late summer when migrants begin fattening up. Instead, they seem to travel to the river to finish molting and fattening up for migration. This goes to show that the riparian habitat at the Boise River is a key resource for neotropical migrants like Yellow Warblers. Congratulations to Zoe for completing this poster and finding such interesting results! Thanks also to Guy Falconer of Sage International School who connected Zoe with IBO to begin this internship. Have you ever heard of a beaver with a headache? Probably not. Beavers eat willow plants that contain the active ingredient in aspirin. And they don’t have to worry about child-proof caps. You can learn about the medicinal and traditional uses of many plants that grow at the City of Boise’s Hyatt Hidden Lakes Reserve at the Hyatt Multi-Cultural Habitat Enhancement Project Open House on March 7 from 5:30-7:30 at the Boise Watershed, 11818 W Joplin, Boise 83714. Plant ecologist, teacher and author Roger Rosentreter Ph. D will share his ethnobotanical knowledge of Idaho’s native plants. Martha Brabec, City of Boise Open Space Restoration Specialist will talk about invasive plants at the reserve and the ongoing control strategies. BREN volunteer Conner Jackson will explain why Russian olive trees are being removed. Eric Willadsen of the Land Trust of the Treasure Valley will provide an update on the Hyatt Multi-Cultural Habitat Enhancement Project including upcoming opportunities to be part of this cooperative effort. The presentations start at 6:00 pm. Before and after the presentations, you can visit with representatives from the Idaho Weed Awareness Campaign, Deer Flat National Wildlife Refuge, Idaho Firewise, Community Native Plant Nursery, Boise River Enhancement Network and more. The educational exhibits at the Boise WaterShed will be open for the kids to enjoy during the open house. 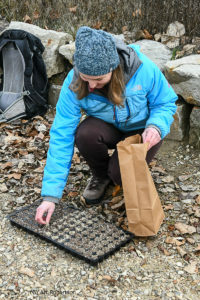 With spring right around the corner, Hyatt Multi-Cultural Habitat Enhancement Project partners are preparing to transplant native plant seedlings from germination trays into cones for the summer growing season. 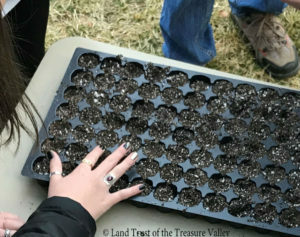 Over the past three months, volunteers planted more than 50 germination trays with seeds gathered from the reserve and other Treasure Valley locations. Members of Girl Scout Troop 105 pictured below are growing two trays from seeds they planted in January. Those plants will find a new home in the reserve next fall. 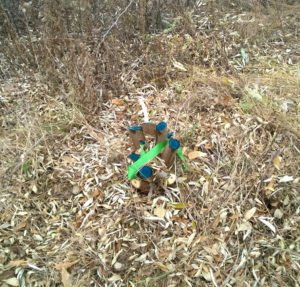 The battle to control weeds at the reserve begins anew in the spring, and this year Weed Warriors will be trained to tackle the task. 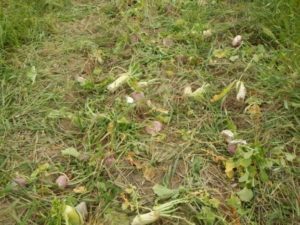 Weed Warriors are specially-trained volunteers who adopt specific areas to pull weeds on a regular basis. According to Martha Brabec, Weed Warriors made a difference in the foothills in 2017, and she’s excited to provide a training specifically for the Hyatt Hidden Lakes Reserve on April 25. Field trips to the reserve for new residents from many nations and others will also be on the project schedule for the spring when migrating birds are at the reserve. 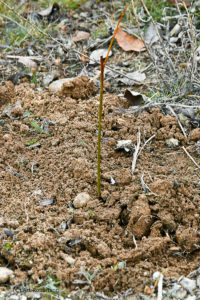 Seedling planted by volunteers at Hyatt Reserve. Photo by Art Robertson. 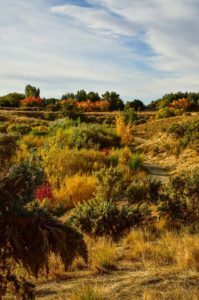 The Hyatt Multi-Cultural Habitat Enhancement Project is led by the Land Trust of the Treasure Valley, Boise River Enhancement Network, and the City of Boise. Project partners include U.S Fish and Wildlife Service, Idaho Office of Refugees by Jannus, Big Brothers Big Sisters of Southwest Idaho, Golden Eagle Audubon Society, Intermountain Bird Observatory, Boise State University, The Wetlands Group, Idaho Fish and Game, Idaho Weed Awareness Campaign, and Partners for Clean Water. The goals of the project are to establish bird-friendly, fire-resistant vegetation on hillsides at the reserve and help community members of all backgrounds connect to this unique outdoor space. A walk through the city of Boise’s Hyatt Hidden Lakes Reserve in the middle of the winter is a great time to see plants in their dormant phase. Especially easy to pick out in the winter at Hyatt is the Russian olive– a non-native small tree or shrub that grows in abundance on the shores of each of the lakes. If you’re a frequent visitor to the reserve, you’ll easily note the spread of Russian olives over the past decade.The City’s embarking on an ambitious plan to reduce the Russian olive population at the reserve, a plan that will improve bird habitat at the reserve. Russian olive trees at Hyatt Reserve. Photo by Conner Jackson. Russian olive, Elaeagnus angustifolia., is a deciduous shrub or small tree native to southern Europe and Asia. It has thin, silvery-gray leaves and reddish bark that is commonly covered in sharp thorns. They can grow up to 45 feet tall. 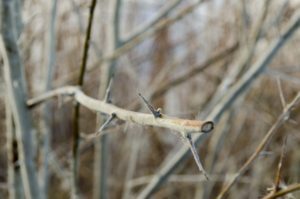 Russian olive trees have nasty thorns. Photo by Conner Jackson. Right now, the leaves of Russian olives have fallen, but in the springtime, the trees will leaf out and produce yellow flowers and small, oval shaped fruits. Those fruits will likely be eaten birds and other animals in the reserve when they are fully ripened in the fall. Russian olive trees are very capable plants that have spread widely since their introduction. They can tolerate infrequent fire, browsing, temporary flooding, and mechanical cutting. Russian olive can grow from seeds dispersed by wildlife, stump sprouts, stem cuttings, and root pieces. They were planted across North America since the early 1900s for windbreaks, erosion control, and to provide food and cover for wildlife. 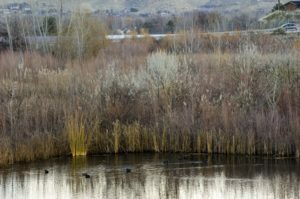 Russian olive trees are found extensively in wet-saline and riparian environments, including Hyatt Hidden Lakes Reserve. The problem is the Russian olive is too capable. 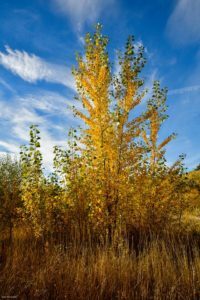 The trees are quick to displace native species such as willows and cottonwoods by outcompeting them for resources, including access to sunlight and water. The Russian olive is a poor replacement for the native plants. Aside from their fruit Russian olive trees are not edible by birds and wildlife found in in the Boise River watershed. 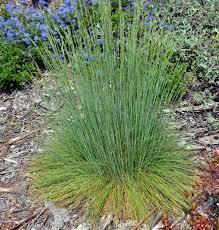 They can crowd out other plant species that provide great habitat for wildlife. Herbicide applied to the stumps prevents regrowth. Volunteers removed Russian olive trees in November 2017. The City of Boise, as part of a reserve habitat improvement project, is removing Russian olive trees. Both City Forestry crews and volunteers, including BREN members, are involved. The goal is to prevent Russian olive trees from completely crowding out desired native species. Trees of all sizes are being removed and stumps are being treated with herbicide so they don’t re-sprout. Vegetation is so dense around the lakes, that open spaces created by Russian olive removal are expected to be quickly filled by native plants. Not every Russian olive tree will be removed to preserve aesthetics and the buffer between Maple Grove Rd. and the reserve. Learn more about BREN’s cooperative Hyatt Hidden Lakes Reserve Habitat Enhancement Project. Join BREN, the Land Trust of the Treasure Valley and City of Boise for a Hyatt Reserve Open House where you’ll hear from Conner and others. It would have been hard to find any reference to soil health twenty years ago. Soil was conventionally treated as an inert growing medium. Today’s explosion of interest in soil health reflects a fundamental shift in soil science and a corresponding shift in the way we care for our nation’s soils. Soil is now recognized as a living ecosystem teeming with billions of bacteria, fungi, and other microbes that are the foundation of an elegant symbiotic ecosystem. 3. 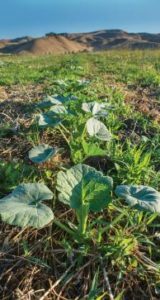 Preventing soil and pollutants from leaving farm fields. Soil health is dynamic and changes in response to management practices. Management practices can affect the amount of organic matter in the soil, the presence of which is critical for soil ecosystem function. 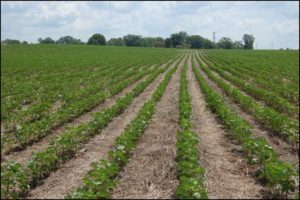 Management practices also affect soil structure, soil depth, and water and nutrient holding capacity. 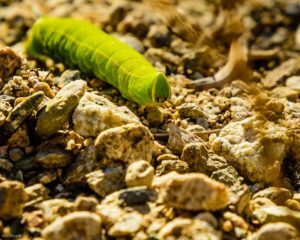 Soil health is improved when farmers mimic nature; when the myriad of creatures that comprise the soil food web are cared for and not abused. A fully functioning soil produces the maximum benefit at the least cost. It is crucial to integrate and follow all soil health management principles for the soil to become and remain healthy. The Boise River Enhancement Plan recommends adoption of these agricultural best management practices to enhance water quality in the Boise River and its tributaries. Water in the Boise River will have less sediment and phosphorus because of a new partnership between the City of Middleton and Drainage District No. 2 (DD2). The innovative water quality improvement project will remove sediment and phosphorus from the Mill Slough, a major Boise River tributary. 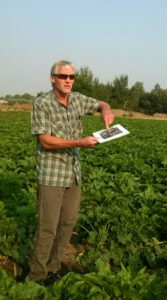 This partnership between the City and DD2 demonstrates how cities and the agricultural community can work together to reduce non-point pollution in the Boise River watershed. 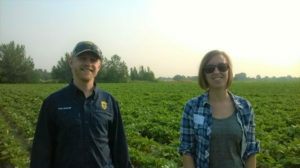 Chris Yarbrough, IDFG and Jessica Harrold, Ada Soil and Water Conservation District and BREN visit the project site. The Mill Slough discharges to the Boise River near Middleton Road and is one of twelve Boise River tributaries identified in the 2015 Lower Boise River Total Maximum Daily Load (TMDL) that need to contribute less sediment, bacteria and nutrients to the Boise River. According to US Geological Survey data, Mill Slough has the fifth highest discharge of total phosphorus when compared to other Boise River tributaries. Discharge loads average 125 pounds per day. The Mill Slough is an integral part of DD2’s drainage system that serves the north side of the Boise River. 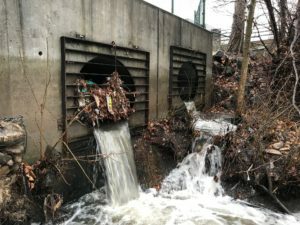 The Mill Slough conveys irrigation water that flows off agricultural fields known as return flow, stormwater from urban residential areas, and municipal wastewater discharged from the City of Star. 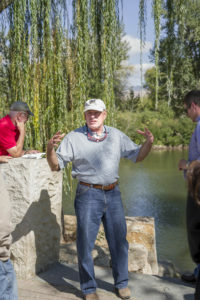 The three-phase water quality improvement project, as conceived and developed by Dr. Jack Harrison with HyQual P.A., starts with construction of an automatic weir structure installed in the Mill Slough a short distance upstream from the Boise River. The weir will increase the Mill Slough water level and form a small sediment settling basin. To prevent downstream spiraling of nutrients that collect in the settling basin, DD2 and the City will remove sediment and phosphorus from the basin. 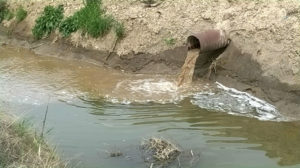 The sediment will be sampled and removal rates tracked to demonstrate the effectiveness of this “in-channel” treatment. Sediment and phosphorus removed from the settling basin will be applied to City-owned land. It is estimated the project will result in an average annual sediment load reduction to the Boise River of about 900 tons/year and a total phosphorus load reduction of about 365 pounds-P/yr. In the next phase of the project, the phosphorous-rich water in Mill Slough would be diverted south over City-owned land using historic overland flow channels that drain to the river. The final phase of the project could include a higher level of water quality treatment via expanded riparian flow channels and newly constructed wetlands and/or treatment basins. Read the Mill Slough Water Quality Plan Description. To help finance the Project, the City and DD2 jointly applied for a matching grant of $172,500 from the Lower Boise Watershed Council (LBWC). 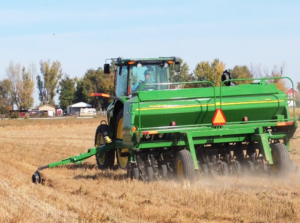 The LBWC was awarded $250,000 from the State of Idaho’s Agricultural BMP General Fund, and, on October 12, 2017, the LBWC approved a grant in the amount of $172,500 for the joint City/DD2 Project. 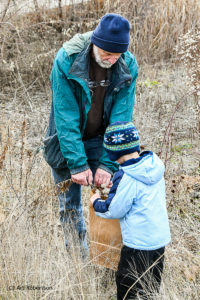 Abe helps Granddad Gary collect seeds. 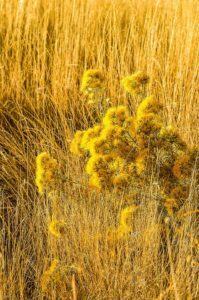 Energetic groups of adults and kids spread out across the City of Boise’s Hyatt Hidden Lakes Reserve in early December in search of the fuzzy dry flower heads of rabbitbrush plants. The once-bright yellow flowers had turned a faded beige and harbored thousands of tiny seeds the volunteers carefully collected in paper sacks. Back at the trailhead, experts with the Land Trust of the Treasure Valley and Golden Eagle Audubon Society and Boise River Enhancement Network Coordinating Team members Tamsen Binggeli, Lisa Harloe, Erin Brooks, Kathy Peter and Charissa Bujak helped the volunteers plant the seeds in germination trays. 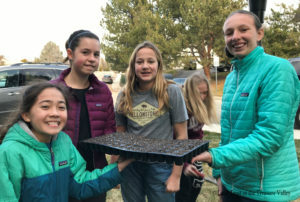 The volunteer native plant gardeners then took the trays home to tend until the seeds germinate and the rabbitbrush seedlings are big enough to transplant. All the fun is part of the Hyatt Hidden Lakes Reserve Habitat Enhancement Project, a partnership between the City of Boise, Boise River Enhancement Network, Land Trust of the Treasure Valley and other local organizations supported, in part, by funding from the National Fish and Wildlife Foundation. The goals of the project are to improve the hillside habitat by restoring native plants and provide opportunities for community members of all backgrounds to develop a connection to this unique outdoor space. 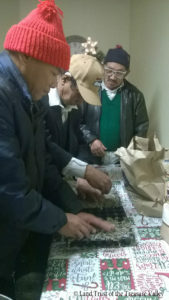 The seed gathering and plant growing is part of the project’s community plant nursery, a program to have volunteers grow plants well adapted to local conditions and use them for site restoration. 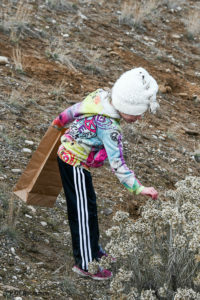 The rabbitbrush grown from seeds collected by these volunteers will be ready to plant at the reserve in about one year. Amber, Nara and Jai plant seeds. Amber and Nanda’s tray is protected from squirrels. 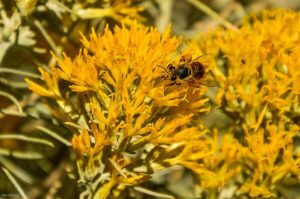 The volunteer native plant gardeners will be back in the spring to transplant the seedlings into growing pots for the summer, and next fall, the new rabbitbrush will be planted at the reserve. The project is led by the Land Trust of the Treasure Valley, Boise River Enhancement Network, and the City of Boise. Project partners include U.S Fish and Wildlife Service, Idaho Office of Refugees by Jannus, Big Brothers Big Sisters of Southwest Idaho, Golden Eagle Audubon Society, Intermountain Bird Observatory, Boise State University, The Wetlands Group, Idaho Fish and Game, Idaho Weed Awareness Campaign, and Partners for Clean Water. 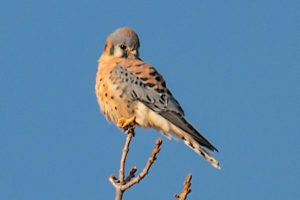 The Boise River Enhancement Network, the Land Trust of the Treasure Valley and other organizations and volunteers are working with the City of Boise to reduce weeds and improve habitat for birds at the City of Boise’s Hyatt Hidden Lakes Reserve. The groups are implementing recommendations of the Hyatt Hidden Lakes Reserve Master Plan with support from the National Fish and Wildlife Foundation. The Hyatt Hidden Lakes Reserve Habitat Enhancement Project will improve the upland habitat on the hillsides now overrun with undesirable species including feral cereal rye, kochia, tumble mustard, and cheat grass. The invasive plants provide poor habitat and pose a fire risk to the reserve and surrounding neighborhoods. 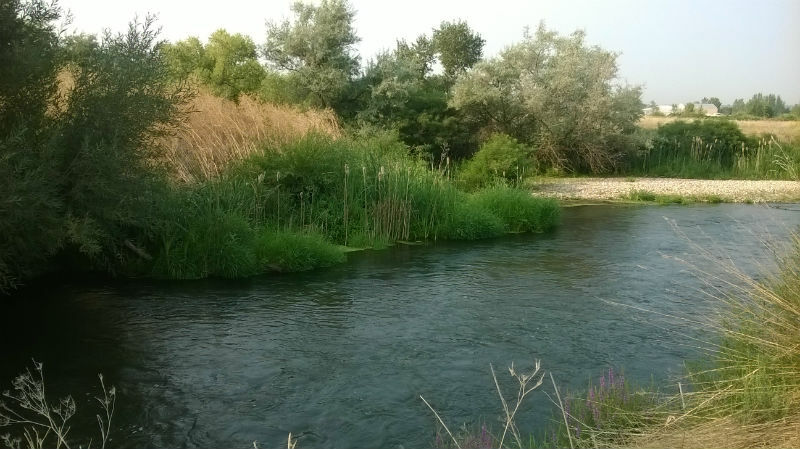 The Boise River Enhancement Plan recommends increased control of invasive and non-native plants. Project partners assembled a team of habitat experts who visited the reserve in September and made site-specific recommendations that Martha Brabec, Boise City Department of Parks and Recreation Open Space Specialist, has incorporated into the draft Hyatt Hidden Lakes Revegetation Proposal. Ada County Weed Control applied herbicide to some areas in the reserve this fall to kill invasive grasses. Volunteers and staff will plant drought-tolerant species including sagebrush, sandberg’s bluegrass, Canada bluegrass and sheep fescue in these areas in 2018. Low flammability shrubs such as oakleaf sumac and mockorange and low growing grasses will be planted in the uplands on the western edge of the reserve. Clusters of chokecherry, golden current, rabbitbrush, and sagebrush will be planted in the transition zone between the wetlands and uplands. Visitors have observed 124 species of birds at the reserve. These include finches, wrens, sparrows, woodpeckers, swallows, warblers, hummingbirds, doves, quail, hawks and other species that use the uplands. The proposed enhancements will greatly improve nesting, foraging, and cover habitat for the upland birds. Native plants support populations of insects and critical pollinators too. Heidi Ware of the Intermountain Bird Observatory will make a special presentation on the “Hillside Birds of the Hyatt Reserve and the Plants They Love” on Thursday, November 30 as part of the Hyatt Reserve Open House. 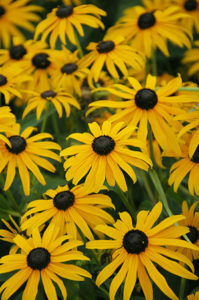 Native plants support healthy populations of insects and pollinators. Photos by Ken Miracle. The Open House is Nov. 30 from 5:30 – 7:30 pm at the Boise WaterShed, 11818 W Joplin Rd, Boise, and presentations start at 6:00. Information about the project and the draft Hyatt Hidden Lakes Revegetation Proposal will be provided and public comments will be accepted. “We want to hear what reserve users and reserve neighbors think about the proposal. Engaged community members created this special pocket of urban open space and strong community involvement is needed now to make these desired improvements,” said Martha Brabec. Native basin big sagebrush flourishes on the south hillside. Photo by Ken Miracle. 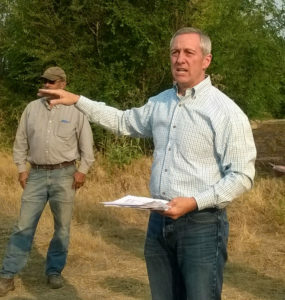 With support from the National Fish and Wildlife Foundation, BREN, the Land Trust of the Treasure Valley and many other community partners have started a new project at the City of Boise’s Hyatt Hidden Lakes Reserve. The goals of the 18-month project are to improve hillside habitat at the reserve and introduce new visitors to the urban open space. 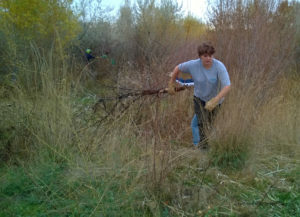 Xylem Inc. employees Marie, Michael, Ladd and Kristin spent a morning removing russian olive trees at the reserve. BREN Coordinating Team member Lisa Harloe points out ducks to Indra, a new resident from Bhutan on Oct. 30. Mu Hla Htoo and Hserry enjoy bird watching during a project field trip on Oct. 17. The reserve has a variety of wetland and hillside habitat. Photos by Ken Miracle. 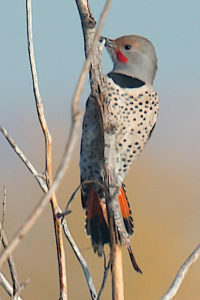 Many birds are found at the reserve. Photos by Art Robertson.